“Nickelodeon’s animated television series Sanjay and Craig follows best buds Sanjay Patel and Craig Slithers as they embark on epic kid-inspired quests that are at times totally ridiculous, absolutely gross and weirdly sweet. Now, the duo is set to conquer a new medium—the world of comics and graphic novels—with Sanjay and Craig: Fight the Future with Flavor! This first edition of Sanjay and Craig features six stories about a boy, Sanjay, and his pet snake, Craig. 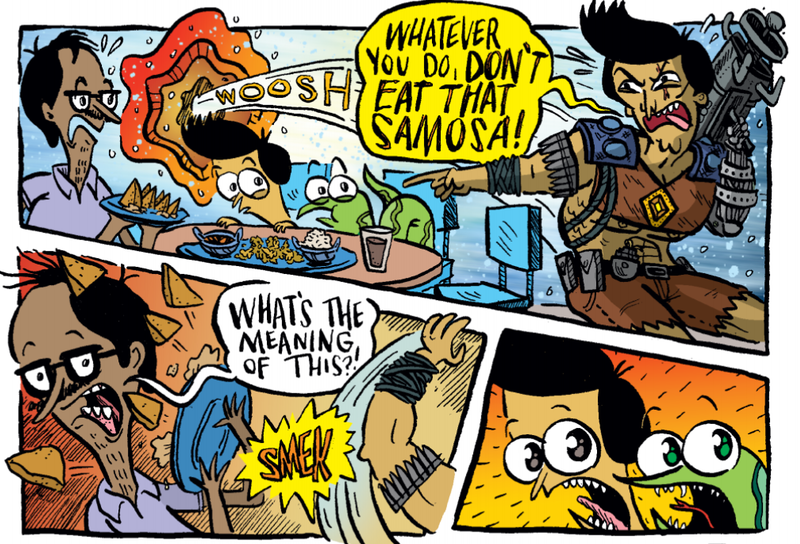 In the title story, “Fight the Future with Flavor,” Sanjay’s father fixes his son and Craig an afternoon snack of traditional Indian food. Sanjay and Craig are both repulsed. The duo prefers a diet of hot wings from the Frycade restaurant. To help the two get out of the nutritious snack, Sanjay’s alter ego materializes. He tells an apocalyptic story recalling the day he ate just such a snack, and what it caused. Instead of commercial interruptions, fictitious movie trailers fill the space between each story. Tufflips Productions announces the arrival of each movie. 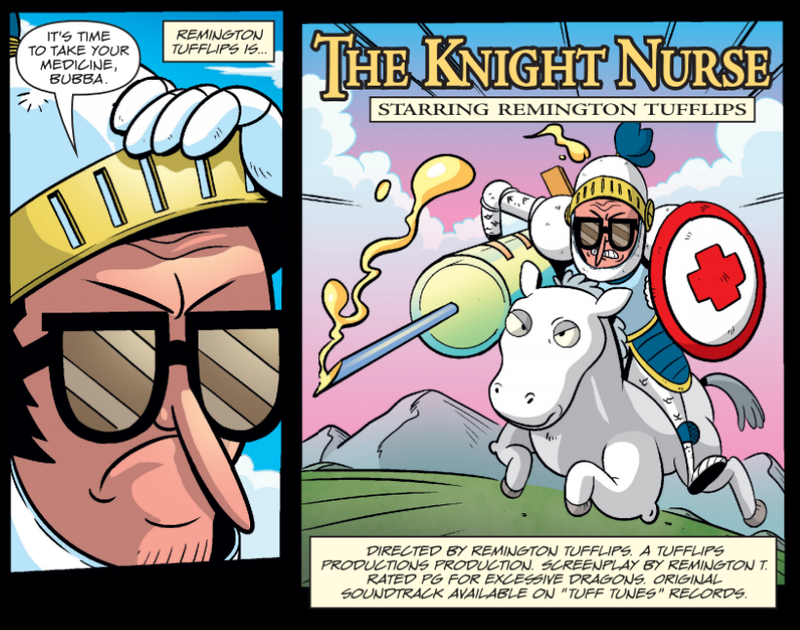 Remington Tufflips is the star, director, producer, writer, and anything I might have forgotten. 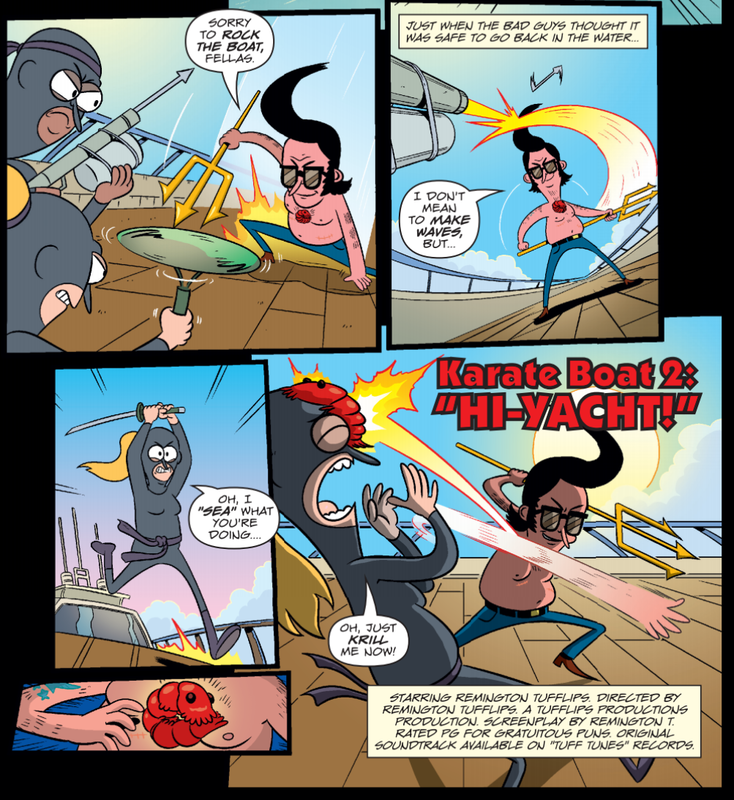 First up, the swashbuckling high seas adventure “Hi-Yacht,” rated PG for “gratuitous puns.” Sanjay is the winner of a video game contest at the Frycade, winning a month of free hot wings, in “Hot Wings from Heck.” Sanjay and Craig take advantage of the prize by eating hot wings three meals a day, nearly putting the Frycade out of business. Penny, the owner, builds a Frankenstien-ish hot sauce that self-duplicates and then tries to take over the town. Sanjay and Craig are heroes when they eat the town clean. 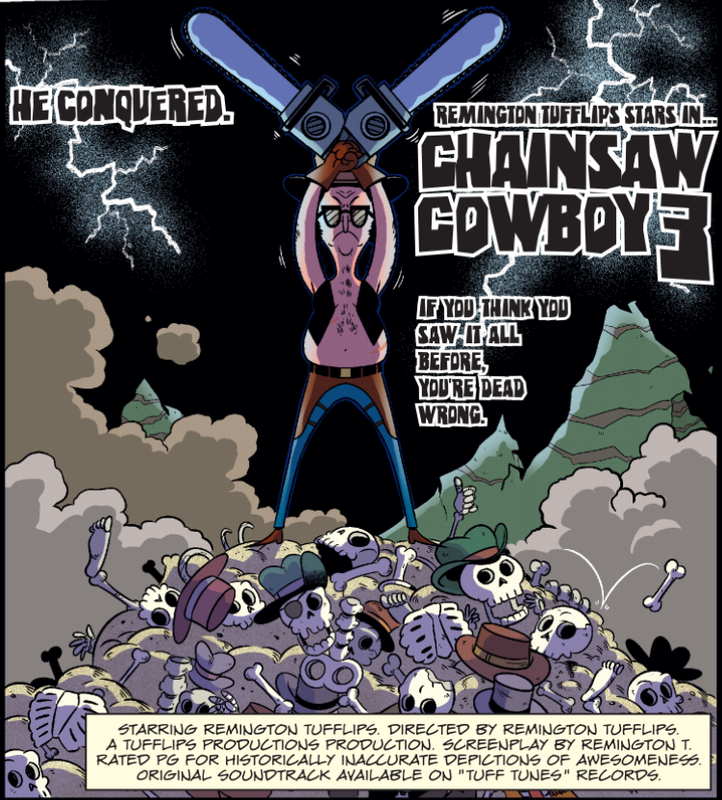 A chainsaw toting cowboy arrives to clear the town of rabid skeletons, in “Chainsaw Cowboy 3,” rated PG for “historically inaccurate depictions of awesomeness.” Sanjay and Craig awake in the middle of the night with the munchies. While watching an old (old?!) 1980’s movie, the hero claims his “signature scent, Buttermilk Breeze” makes him the man he is. Sanjay wants a bottle and his father happens to have one, but the cologne has changed in its old age: it becomes a green “Buttermilk King” with horns and a nose ring. This king has come seeking vengeance for his imprisonment. Sanjay and Craig find a creative way to disarm this vengeful green king. 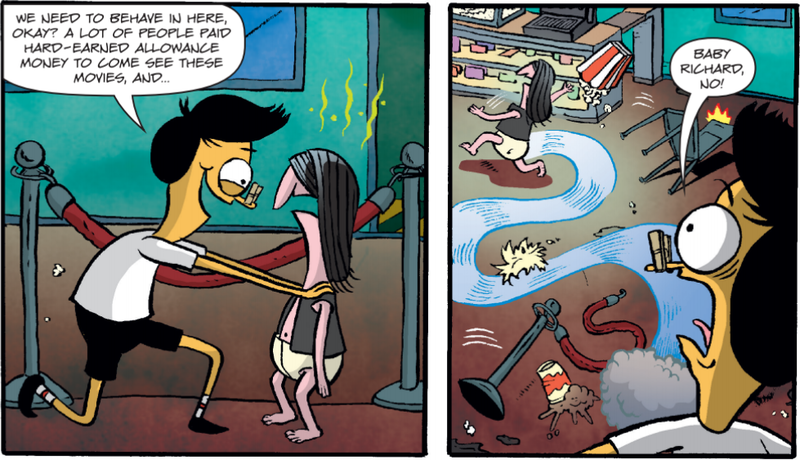 This Sanjay and Craig graphic novel is fun, tongue-in-cheek geekiness. Sanjay and Craig take the boy-and-his-pet to the extremes with Craig and his human capabilities. Their adventures are strange, absurd, and what pre-teen boys—and many girls—will love. The illustrations are colorful and filled with imagery boys crave (aliens, destruction, strange characters, and bodily functions, among other oddities). I rate Sanjay and Craig #1: Fight the Future with Flavor 4-Stars, for venomous hijinks, outlandish adventures, and high scale comic fun. 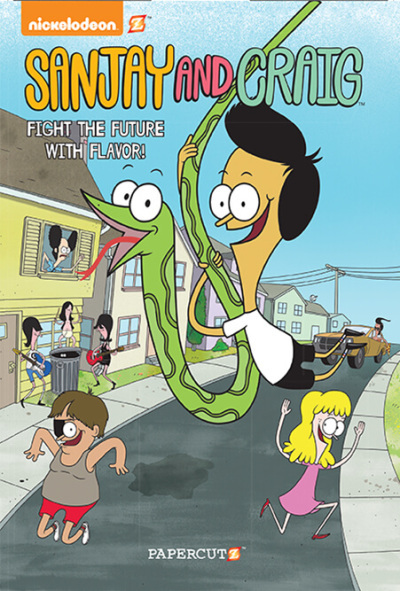 Up Next, Sanjay and Craig #2: New Kid on the Block , (available now). 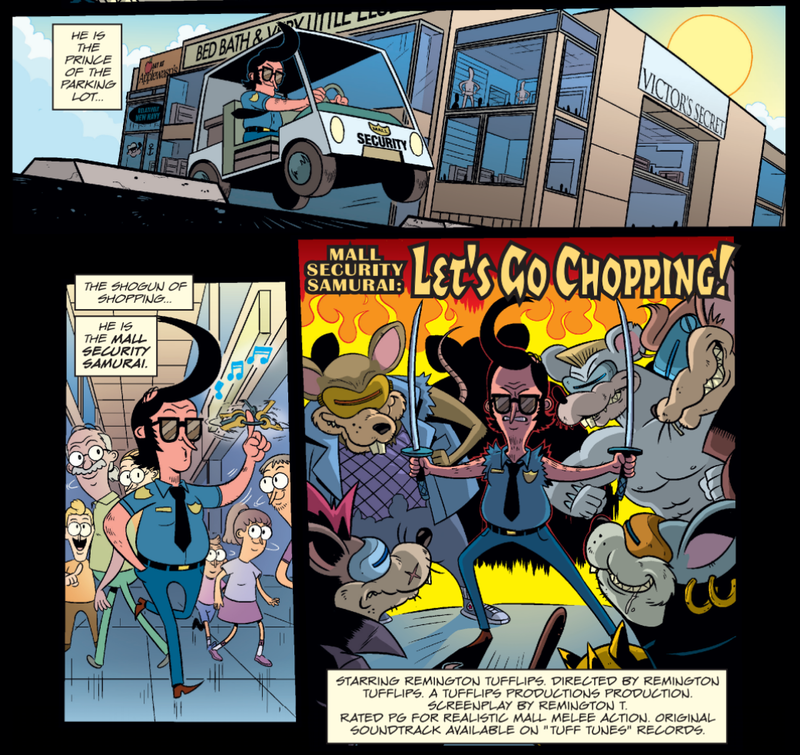 A SANJAY AND CRAIG #1: FIGHT THE FUTURE WITH FLAVOR. Text and animation copyright © Nickelodeon and Papercutz. Reproduced by permission of the publisher, Papercutz, New York, NY. QUICK NOTE: This year is Papercutz’s ten-year anniversary. A joint comic deal with Nickelodeon is an awesome way to celebrate. Many of Nickelodeon’s animated series will find a new home in graphic novels for kids to enjoy. Soon to unveil are Breadwinners, Harvey Beaks, and Pig Goat Banana Cricket. The two companies also launched a new magazine called Nickelodeon Magazine. The magazine will have posters, activities, and comics among other kid-fun things. I have not seen a copy, but my guess is the magazine will be similar to what a lighter kid-version of Mad Magazine would be like. 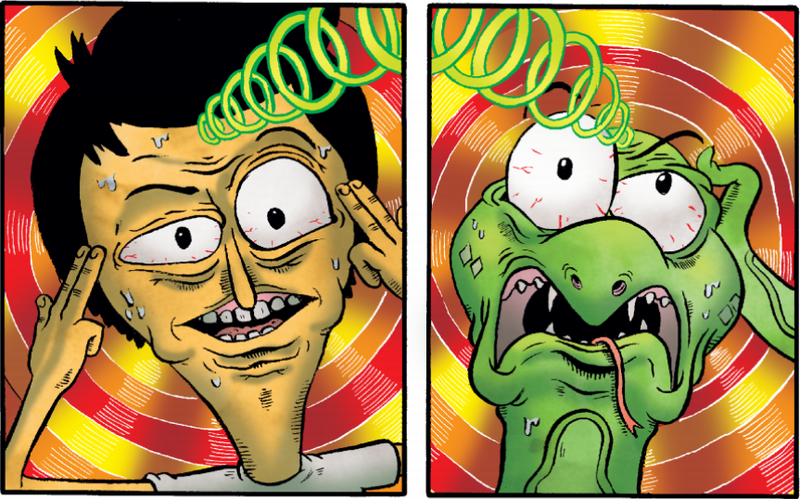 Purchase Sanjay and Craig #1 at Amazon —Book Depository—IndieBound Books—iTunes Books—Papercutz. 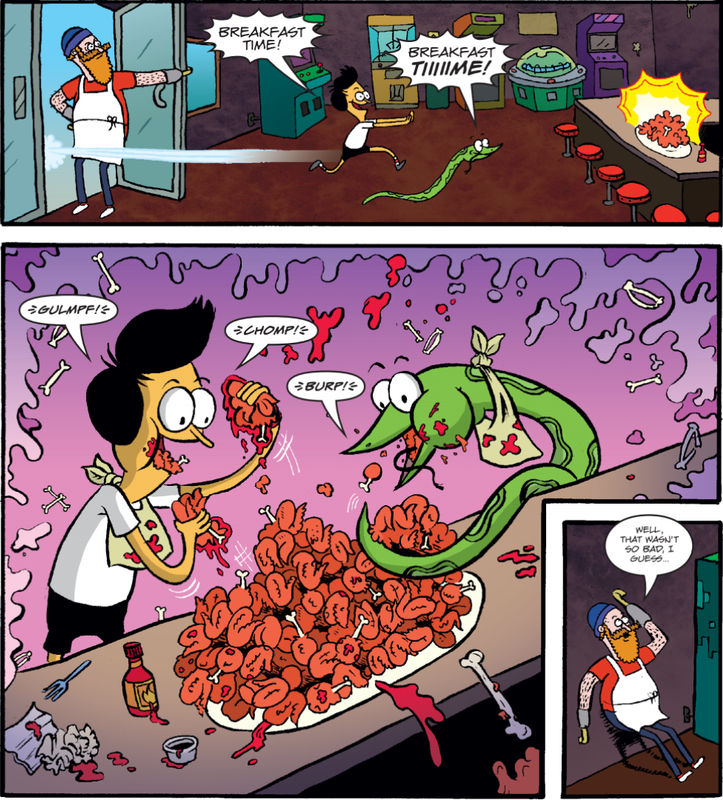 Learn more about Sanjay and Craig #1: Fight the Future with Flavor! HERE. . . Nickelodeon is a trademark of Viacom International Inc.
SANJAY AND CRAIG: FIGHT THE FUTURE WITH FLAVOR. © 2015 Papercutz & Nickelodeon/Viacom. Used by permission of Papercutz. I honestly don’t know whether I would like this or not. Great review though! I’m sure this series will appeal to its target audience. What fun! I guess this is a hit on TV, so there is an audience; mostly boys I’d guess.